The art of compelling storytelling is the core focus of the Hartley Film Foundation’s mission. Storytelling in documentary film is the foundation’s tool for connecting audiences to new experiences and ideas about real people, places, and events. The foundation supports filmmakers proposing narratives about world religions and spirituality. Implicitly, a primary Hartley goal is to strengthen interfaith understanding through these films. Hartley supports documentary filmmakers in two different ways. A seed grant program funds research and story development; and the foundation offers filmmakers nonprofit fiscal sponsorship for their projects. Hartley seed grants precede film production, so Hartley is often the first donor to a film. Filmmakers accepted into the fiscal sponsorship program can offer individual donors and foundations tax deductibility for their contributions, since Hartley is a 501C3 organization. Hartley also offers each film it sponsors the opportunity for one-on-one consultations with a San Francisco-based company called Active Voice. Active Voice’s expert communication strategists take the documentary’s message and generate recommendations for reaching the widest audience and creating the greatest impact for the film’s unique message. Active Voice focuses on reaching organizations most receptive to a film’s message as well as organizations that, inspired by the film’s message, might therefore take action. Active Voice explores reaching “beyond the choir” with each filmmaker, connecting national and international grassroots organizations, and creating novel interactive educational platforms. As managing director of Hartley Film Foundation, what do I look for in a grant and/or fiscal sponsorship application to Hartley? First, does the film narrative in any way disparage a particular religion or spiritual point of view? Hartley’s Board of Directors does not shy from taking on the controversial issues of our day or from issues related to faith and quesioning faith. But each story needs to enhance empathy and understanding across the religious spectrum. 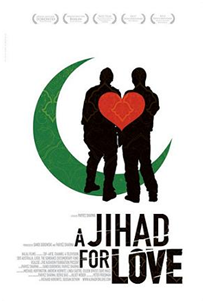 Consider the film A Jihad for Love. Hartley supported this documentary about the persecution of gay and lesbian Muslims in Iran, Iraq, Egypt, Syria and Turkey. Each character in the film was a believing gay Muslim who was looking for acceptance within the faith. Hartley also supported the documentary Nobody Should Know, which tells the stories of three courageous Orthodox Jews forced by the customs of their community to keep their life-threatening illness, the genetic disease cystic fibrosis, a secret not only from their communities but also from their loved ones. Hartley seeks stories with an emotional power that can spur movements for social change. 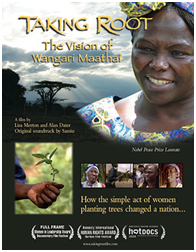 Taking Root: The Vision of Wangari Maathai follows Kenyan Nobel Peace Prize Laureate Wangari Maathai. She started a nationwide movement to plant trees as a way to safeguard the environment, protect human rights, and defend democracy. Another documentary in production that covers a growing national movement is titled Moral Monday. Director Eric Preston has been following Reverend Dr. William J. Barber, II, the architect of the growing national Moral Mondays movement, since its inception. Rev. Barber dubs the movement “the fight for everyone’s flourishing” and defines it as an inclusive national civil rights movement for people of all faiths or no faith. Another director, Cal Skaggs, has started production on Walking the Tightrope: Religious Freedom in Today’s America, which focuses on the 1993 Religious Freedom Restoration Act (RFRA), a Congressional attempt to redefine the parameters of religious freedom guaranteed in the First Amendment. Love Free or Die, an award-winning film by Macky Alston, follows former New Hampshire bishop Gene Robinson, the first openly gay bishop of Christendom. Little White Lie tells a story of self-identity that is rooted in Lacey Schwartz’s Jewish family experience. Lacey was brought up in a white, Jewish family and discovered, at the age of 18, that her biological father is African-American. Other criteria for acceptance into Hartley’s granting and fiscal sponsorship programs are stories that delight, while allowing the viewer to share the lives of others across faiths and race. The just-completed documentary Deli Man tells the story of a third-generation delicatessen owner and maven, as well as a Yiddish-speaking French-trained chef. Meet the Patels (see the trailer on the left) is a hilarious and heart-felt tale of the societal pressures of marriage in Ravi Patel’s first-generational Indian American family, an environment in which marriages between cultures create conflict, especially in families with strong religious roots. Hartley also considers narratives on cultural trends and religious lives that are misunderstood in Western culture. Casablanca Calling follows three women in Morocco in their historic endeavor to overcome a culture of repression and prejudice as official Muslim leaders. Last Call brings to a film audience the tale of a group of Japanese Buddhist priests who have stepped forward to combat the epidemic of suicide in their country. Hartley does not select grant applications that take the angle of “this is what this group believes” or “this is how this group practices its faith.” Those are important pre-scripted stories that belong on the History Channel or Discovery. Hartley’s hope is that unscripted stories of real people, places, and events will foster increased interfaith empathy and understanding. In the character-driven documentary narratives supported by Hartley Film Foundation, the stories unfold and take unexpected twists and turns, as life does. These films reflect the unpredictability and complexity of humanity, and the resilience of individuals and groups. Hartley celebrates spirituality and religious diversity through intimate and moving storytelling. Older Post"Top 10 Things You Must Know About ..."